I’m going to end Chasing Amazing’s “One Month,” with what is arguably one of the most important Spider-Man No. 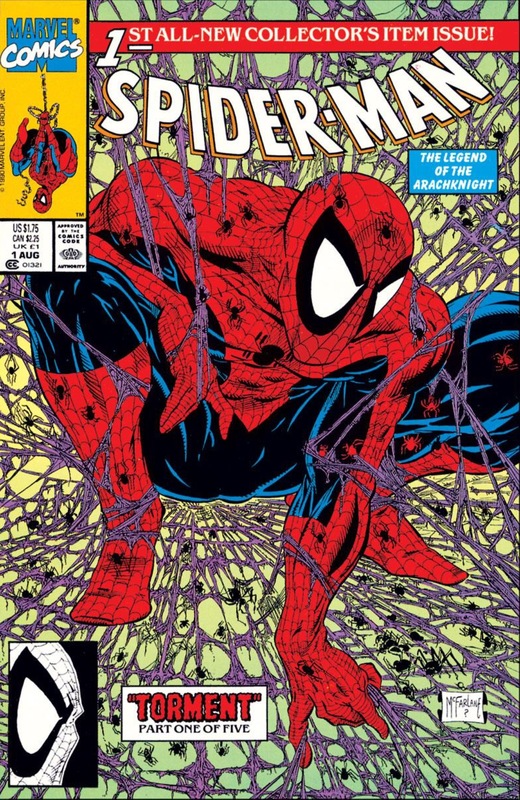 1 issues (at least on a personal level) released in my lifetime, the “adjective-less” Spider-Man #1, which was written and illustrated by industry superstar Todd McFarlane. Keep in mind, when I say this comic book is “important,” I’m not necessarily talking about its quality, just its impact. Similar to what I recently said about “Maximum Carnage,” as a young fan who adored and consumed every Spider-Man comic with McFarlane’s name on it in the late 80s/early 90s, it is partly my fault that this poorly written comic book became such a phenomenon. With the help of multiple variant covers, it sold more than one million copies and I probably bought at least two of them (I remember owning a regular version and a silver ink variant, though I also think I might have picked up a gold ink one as well). In fact, I have a very distinct memory of picking up a silver variant at a collectible/memorabilia show held at an indoor batting range/arcade near my childhood home. My brother and I would attend these shows (I think they were once a month) with regularity because the place was so close and incredibly fun for a couple of adolescents. Unfortunately, this place closed about a year or so after it first opened, leaving my brother and I with nothing again (at least until we learned to drive). Showing just how caught up I was in this book’s hype, I continued to buy the remaining four issues of McFarlane’s opening arc “Torment.” But while I remember the Lizard being the featured villain and the word “Doom” showing up on every other page, I couldn’t tell you anything about this storyline that made a huge impression on me. And yet I can’t think of my childhood and Spidey comics without coming back to Spider-Man #1. Over the past year, I’ve reread this story twice, the first for my inaugural Gimmick or Good? column at Comics Should Be Good, and then again for this post. Over the course of both readings, “Torment” has actually become even more cringe-worthy for me. 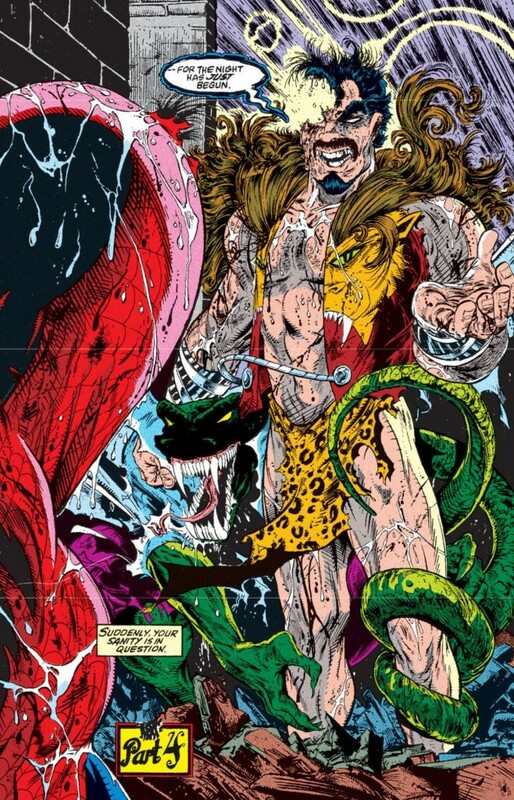 There’s so much to dislike about the arc: the inexplicable overuse of the phrase “Rise Above It All;” how the story unashamedly “borrows” themes and imagery from significantly better arcs like “Kraven’s Last Hunt;” and the fact that McFarlane has removed all sense of humanity (and by consequence, interest) from the Lizard, who is just characterized as a bloodthirsty killing machine throughout. That’s just scratching the surface. Look even more deeply at this arc and you’ll notice over the course of five issues, nothing really actually happens. Despite the blood, teeth and “Dooms” all over the place, this story is passively written. 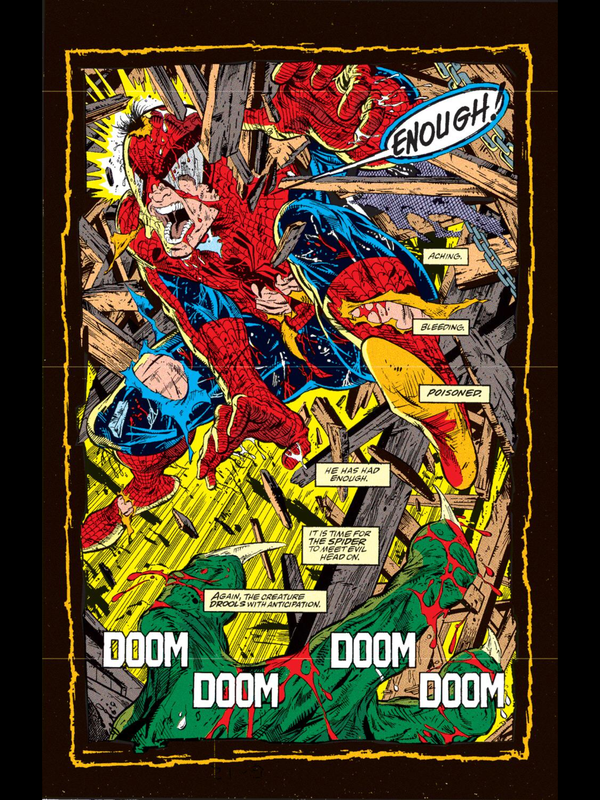 There are multiple huge, vintage McFarlane splash pages and double splash pages in every issue, but they function more as posters to rip out of the comic rather than something that is integral to a cohesive narrative. And yet, despite the way I’ve dumped all over this series (now two times if you count Gimmick or Good? ), I just can’t separate how awesome I thought “Torment” was when I was barely 10-years-old. In retrospect, this comic should probably offend me a la John Byrne’s Spider-Man: Chapter One. Much in the way that Chapter One was just one big vanity project for Byrne, Spider-Man was something that was created to pacify McFarlane who was an enormous artistic talent, but was “bored” drawing somebody else’s plots (though to be fair, some of David Michelinie’s plots in Amazing Spider-Man were pretty boring). So Marvel handed the reins of a brand new series to McFarlane and reaped the financial rewards of the first issue being (temporarily) the greatest selling comic book of all time. McFarlane left Marvel less than two years later to start the “Image Revolution” and he hasn’t worked on Spider-Man since. But I can’t be angry with this comic or McFarlane. His tenure at Marvel may feel like it was fleeting and short-lived, but in reality, he worked on Spidey, the character, for about three years. That’s a decent chunk of time for an artist who has clearly gone on to do things that even transcend the comic book industry. 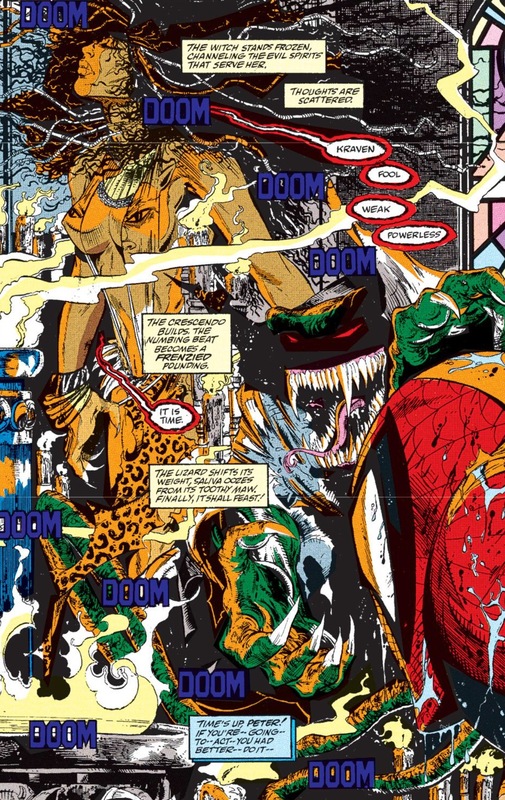 Plus, despite the way I unquestionably recognize McFarlane’s artwork on “Torment” and other Spidey books as being overindulgent and lacking in anatomical consistency (like every other “extreme” artist of the 90s), I still consider myself a huge fan and disciple of his. As I’ve said in previous posts, McFarlane just brought something so unique and fresh to the world of Spider-Man, that it blew me away the first time I opened up an issue of Amazing Spider-Man that he had illustrated. 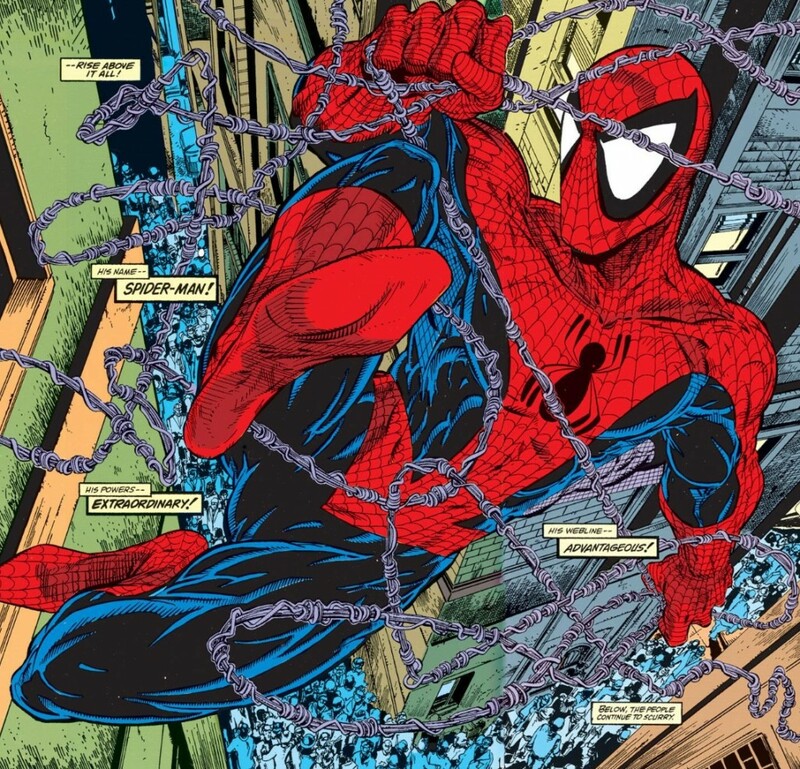 It’s like McFarlane’s artwork inherently knew how to trigger the happiness sensors in every adolescent male’s brain – and then just stay there for the next few decades (or maybe forever… I can’t tell you if my opinion will ever change of McFarlane’s art). I hope you’ve all enjoyed “One Month” as I’ve had fun looking back at some older issues that I probably wouldn’t have written about if it wasn’t for this random “theme” month. McFarlane’s Spider-Man #1 feels like a fitting end cap for this series of articles since it demonstrates how some of the most popular and influential comic books in Spidey history are far from the best. Not to mention that my unwavering love for the comic reflects the era in which I first became attached to this medium. 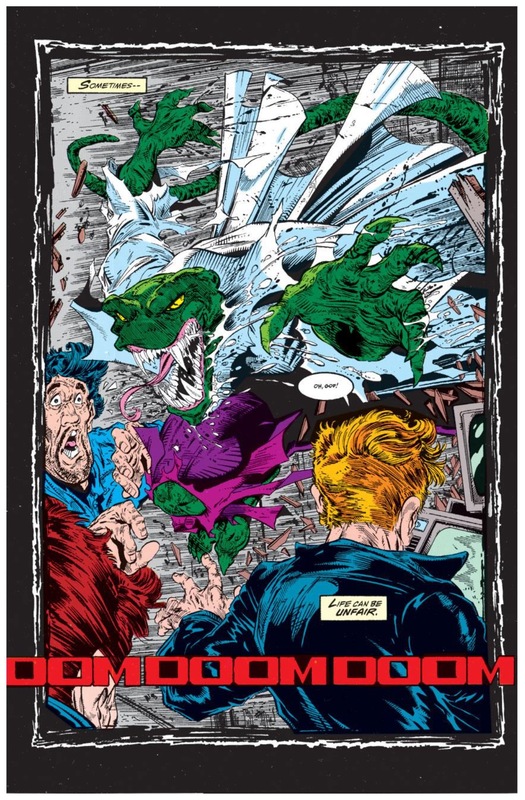 Perhaps the fact that so many of the more ballyhooed comics from the 90s are regarded as being trashy and creatively defunct, explains how I was able to disengage from the medium once Marvel started pumping out stories that I sincerely didn’t like (i.e. the “Clone Saga”). Or maybe it just proves that as a 10-year-old, I didn’t read my comics as thoughtfully as I did a few years later. I have a funny story about this comic. I’ve only ever read the first issue of Torment, and that’s because I accidentally stole it. It was my first time at a comic convention, NYCC in 2007. I was rummaging through all the back issue bins at the retailer tables trying to get a complete run on Gotham Central, as well as score some old Spideys. I passed one table where there sat in a pile apart from the bins about fifty Todd McFarlane Spider-Man #1’s. I thought they were free giveaways like those at many other tables, so I grabbed one off the top of the pile and put it in my bag. I even stayed at the guy’s table and bought a couple back issues. Flash forward two hours, I’m now carrying over a hundred books in my bag (only one stolen AFAIK). I pass the guy’s table and see the same pile of Spider-Man #1’s, now at about 35 and neatly arranged in a display that reads “Todd McFarlane, Spider-Man #1, Collectible! Only $5!” Now I suppose the Peter Parker thing to do would have been to give the guy his book back (or give him the money, but I would never have paid $5 for this comic), but I did not feel very enthusiastic about (i) explaining my mistake, (ii) digging through my bag in the middle of the crowded con floor, (iii) possibly being forced to pay for the book if it got damaged in my bag. So I left it alone, but have since always been sure to wait and ask if something was free, even if it seemed apparently so. Now if there are any outraged retailers out there reading this story, you can take comfort in the knowledge that I did get justice for my crime. For you see, it resulted in me reading a painfully bad comic book called Spider-Man #1 by Todd McFarlane. I would say that’s justice in spades.